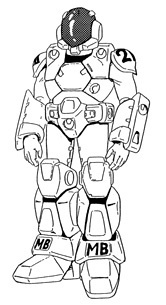 The CVR-3 Riding Suit is the next generation of Mars Base combat armor and was developed to offer improved protection over the CVR-2 and to be compatible with the new Ride Armor mecha. The most notable feature is the armored telescoping boots, which form the lower legs of the mecha in Armor mode. They were designed to increase the pilot's stride in and to attach to the Ride Armor's frame and servos, removing the need for the pilot to support the heavy weapons system with his own strength. The CVR-3M is standard issue for male soldiers and features sturdier leg servos to support the heavier VR-040 and VR-052 Ride Armors. The CVR-3F female version features less servo support as less is needed with the lighter VR-038 Bartley Ride Armor. The CVR-3 armor can stop most small arms and rifle fire and moderate protection against heavy weaponry and Inbit energy attacks. Vulnerable areas of the armor are the upper arms and a small part of the abdomen and back, which are protected by a ballistic under shirt. The armor consists of a light clamshell helmet, a breastplate with shoulder guards, forearm guards, a groin harness, light thigh armor, and heavy leg armor. Filter and independent Oxygen supply, 30 minutes maximum with filter and 5 minutes with internal Oxygen alone. Helmet with variable-tint polarized polycarbon clamshell style faceplate. Utility belt that mounts to the Ride Armor mounting points on the groin harness. The belt must be broken away before Ride Armor transformation can occur. Tool Belt which is almost identical to the Utility belt except it holds most hand held tool mecha technicians require for mecha maintenance. EVA equipment which consists of a enviroment suit worn under the CVR armor and enviroment supply backpack which clips into the two Ride Armor connection points of the breastplate and provides a total of 6 hours of oxygen. The CVR-3 Riding Suit owes much to the earlier CVR-2. For the most part the CVR-2 looks like a more rounded version of the CVR-3, featuring the same combination of hard and soft armor. The CVR-2 lacks the Ride Armor connection points of the later armor, features a non-clam shell style of helmet and can stand less abuse in the field. The CVR-2 has all but disappeared from the battlefield with the proliferation of Ride Armor units among all sections of the Mars Base military. CVR-2 armor can still be found in limited use with resistance groups. Capacity: 3 anti-infantry or 1 anti-armor shots per energy capacitor, 8 capacitor per magazine (in pistol mode); 48 high power anti-armor shots per rifle-stock clip (in rifle mode). The Gallant is the newest all-purpose personal energy weapon serving with Mars Base troops, serving as both sidearm and rifle. In its pistol mode, the Gallant is powered by miniature reloadable capacitors, each of which is able to hold enough energy for three shots on an anti-personnel setting, and one shot on the anti-armor setting. The spent caps eject from the gun, and new caps are fed from and stored in a removable 8-cap clip under the forearm grip. As the pistol mode does not use energy for more than a second, it is not visible on Inbit energy sensors. When a special stock with an energy clip inserted in the rear is added, the weapon becomes far more formidable. Capable of firing forty-eight shots, this weapon can pierce even the smaller Inbit mecha armor with ease. With the powered rifle stock in use, the weapon is easily detectable by Inbit energy sensors. In addition, a barrel extension can be added to the weapon's nozzle which dramatically extends the effective range of the weapon, increases penetration, cools the pistol's barrel and is a flash suppressor, for a slight loss in power for each shot. The barrel can be used in both pistol and rifle modes. A popular, much sort after weapon, the Gallant is a fairly new addition to the weaponry of the Mars Base forces and is a dead give away that the owner is from Mars Base or a well equipped resistance group. 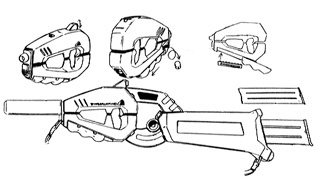 The Wolf pistol was the standard infantry pistol used by Mars Base at the time of the First Earth Recapture Mission. Affectionately referred to as the 'Staple gun', to reduce the size of the weapon the bulky energy clip was mounted in the lower front of the pistol, snapping into the trigger guard. It is a good weapon against human foes, but poor when used against the armor of most Inbit and eventually the Wolf gave way to the Gallant, which had all the features of the Wolf and could be converted into a powerful rifle. The Wolf is everywhere, millions arriving with the Mars Base forces, a common sight where human life can be found. Capacity: 15 shots per energy clip. Though Mars Base forces was happy with the Wolf side-arm series they employed, a need was seen for a more potent laser pistol that had a much higher chance of damaging Inbit mecha. The SAL-9 was developed as a highly accurate armor-piercing pistol, trading a wider destructive bolt for a thinner, more longer ranged shot that could burn through most forms of armor. Internally it was reasonably similar to the Wolf pistol in the rear half, with the front section of the SAL-9 consisting of a complex set of focusing mirrors and cooling baffles. The weapon was powered by energy clip stored in the grip. More accurate over a distance than the Wolf, the pistol could be used as an impromptu sniping weapon in skilled hands. At shorter ranges the SAL-9 offered little advantage, was very heavy and clunky for it's size and never saw wide use outside of special forces units. It was largely replaced by the Mars Gallant, which has a detachable barrel that offers the same features as the SAL-9, but is still in common use by most resistance forces. The FAL-2, like the SAL-9, was created in response to the need for Mars Base forces to develop potent energy weapons for its infantry, in this case an energy weapon capable of firing full-auto bursts. Short and sturdy, the FAL-2 was a powerful weapon, not only against unarmored humans, but against light armor as well. A unique feature of the FAL-2 was that it could also use the SAL-9's clip, or a rifle-stock that contained its own dedicated power pack. In addition, this capability was in large part the inspiration for the Mars Gallant. The FAL-2 has been largely replaced by the Mars Gallant, which in rifle mode can also fire bursts, but still remains in heavy use with most Resistance groups. The Wolverine is an example of the standard assault rifles in use when the Inbit first invaded the Earth. Compact and about the size of sub-machine gun, it is an accurate, low recoil weapon featuring a 120 round magazine. While it was popular with most troops, it was not that useful against the Inbit. Its heavy armor piercing ammunition was more than capable of perforating all human personal armors, though it had little success with even the weakest Inbit armor. The Wolverine gave way to the Mars Base FAL-2 and then the Gallant as the main infantry weapon of Mars Base troops. The Wolverine is very common with most towns, resistance units and bandit groups. Resembling the old Soviet RPG from the 20th century, the RL-1 carries a powerful and longer-range missile, capable of crippling or even destroying smaller Inbit mecha with a single shot. With the introduction of Ride Armors, it fell into disuse in favor of its successor, the RL-6, which was smaller, easier to use, and had a larger capacity of six guided missiles. Still a common sight with bandits and the Resistance, it becomes rarer every day as its supplies of missiles slowly dry up. The RL-6 is the new generation of Mars Base heavy weaponry, a hand-held rocket launcher that fires the same rockets as the VR-041's chest mounted GR-103. It has a six-missile payload, stored in a removable clip, loaded to the left of the targeting sight. The RL-6 was designed so it is able to be used one handed with a Ride Armor (L Model weapon package) or resting on a troopers shoulder. It is one of the most popular infantry weapons because it can be used with or without a Ride Armor and still allows unarmored infantry a reasonable chance of completely destroying Inbit mecha. The RL-6 sees heavy use by all Mars Base and Resistance forces. The EP-37 is another in the new generation of Mars Base heavy weaponry, capable of piercing almost any Inbit armor and doing devastating amounts of damage. The weapon holds 15 rounds per energy clip. Alternatively, the weapon may fire 30 shots at a lower anti-infantry setting. Just like the RL-6, the EP-37 can be used with a Ride Armor as a hand carried weapon or by infantry forces as a squad support weapon. When used by a Ride Armor operator, the mecha's arm servos take all the kick, making it easy to carry and fire, even allowing it to be used one handed. When used by unmounted infantry, a shoulder strap and bipod are usually added, but the weapon is still a bear to carry for long periods. While it carries more ammunition and is equally effective as the RL-6, it is nowhere as popular with unmounted infantry forces, because of its heavy and cumbersome weight. But with Ride Armor troops, it's the single most popular hand-held weapon. It sees heavy action with all human forces. The Cobalt Limpet mine is the standard explosive device used by Mars Base forces. The explosives, detonation device and timer, with digital readout, are all contained in the sturdy metal casing. The timer can be set for up to 60 minutes and stopped up 5 seconds before detonation. An adhesive pad on the back can allow the mine to be attached to almost every surface and height. Common among former Mars Base military resistance units or those who commonly raid crashed ships, most other forces create their own homemade explosives and bombs. The Vid-Cam is used for archival and reconnaissance in battlefield environments. The camera includes all standard civilian video camera features (zoom, playback,) in a hardened military case. The Vid-Cam is capable of digitally storing twelve hours of footage on a removable memory cartridge. Unit also includes printer to full-color, hard copies of single frames. 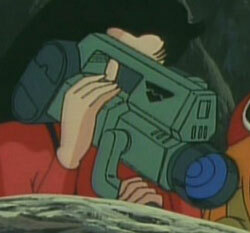 Camera sits on the operators' right shoulder, and can be attached and used in all modes of the Ride Armor. 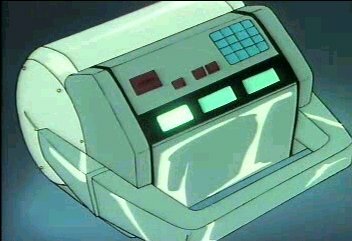 Often referred to as a 'energy flare', it is mine-sized device that uses a single hydrogen cell at maximum yield to emulate the characteristic energy radiation of a much larger vehicle or mecha. At long range, the bio-emulators' can act as a decoy to trick the enemy into think they are being attacked by a much larger force and is highly effective against the Inbit energy sensors. At short range however, the Inbit will quickly realize the energy source is too constant to come from a mecha. Variants of this device are also occasionally been issued to Special Forces units. The holo-pendant is a way to carry loved ones with you. The pendant can fit in the palm of the hand and be worn as a necklace or pocket watch. The holographic projector bead can recreate a tiny, 6 inch, 3-D image of person and record a message that lasts about 30 seconds. Visually resembling a 20th century slide-projector, the portable holo-projector can playback color 2D or full 3D video, projecting the footage inside a 60cm diameter sphere. These are the standard issue Mars Base binoculars. Built to survive combat conditions, they feature multiple levels of magnification and an in-built compass. Included in all Mars Base troopers' kits and fighters is the standard Earth survival kit. The small-reinforced box about the size of briefcase contains a first aid kit, pocketknife, fire lighter, flash light, eating utensils, canteen and two weeks worth of field rations. All Ride Armors come with two storage cases which attach to the Ride mode's chain guards. These cases detach and drop away when the vehicle converts to Armor mode. One case can store 12 missiles, 2 HBT cell 4-paks or one suit of CVR-3 armor. As the Refles began to anticipate the transmutation of her race into the humanoid Solugi form, she saw the need for a personal weapon, eventually settling on a pistol. Prior to this time, the Inbit had relied entirely on the Protector armor in humanoid style combat and relations. Based upon the internal mechanisms of the Mars Gallant H-90, the removable grip contains an energy magazine instead of the Gallant's energy capacitor system. Genesis Climber MOSPEADA (R) is the property of Tatsunoko Productions/Artmic Studios. 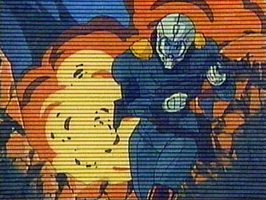 Robotech (R) is the property of Harmony Gold. This document is in no way intended to infringe upon their rights.